Taste dozens of organic and natural wines alongside artisan cheeses at Santa Monica's eco-friendly wine bar. January 4, 2010, 1:31 p.m.
Made a New Year’s resolution to stick to organic and natural wines? If you’re a would-be sustainable wine connoisseur in the Los Angeles area, you no longer have to order entire bottles from eco-conscious wineries just to get a decent sampling of sustainable elixirs. Just stop by Pourtal! 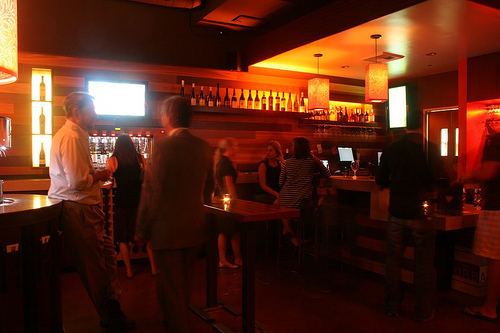 This eco-conscious wine bar, located a block away from bot the famous Santa Monica beach and the popular tourist shopping strip Third Street Promenade, specializes in organic and natural wines — and offers affordable, one-ounce tastings with its hassle-free self-serve enomatic machines. On any given day, you can walk in and pick from 40 wines — 24 of them grouped into “tasting tours” of eight wines each — by buying a pre-paid card, popping it into a machine, and pushing the button for the wine you’re curious about. I stopped by on New Year’s Eve with some friends to try a tour called “Oregon by Alsace,” a group of eight white wines — five organic and one biodynamic — from Oregon and Alsace. According to Pourtal’s paper “itinerary” (PDF) — printed on 100% post-consumer recycled paper, of course — provided for the tour, “Oregon Wine Pioneers not only learned winemaking from their Alsatian friends, but soon realized the climates even ran along the same latitude.” My favorites were the Gewurztraminers, the melony Ramsom “Temperance Hill” from Willamette Valley, Oregon and the very peachy Meyer-Fonne “Pfersigberg” from Alsace. If you try a wine and love it, you can order a bottle right there — or buy a bottle to take home at the discounted retail price. The wines are are changed up every 3-4 weeks — and the food menu’s frequently updated too, since many dishes make use of seasonal farmers’ market produce. Plus, cheese lovers can pair their wines with artisan cheeses from Andrew’s Cheese Shop — and the extra-hungry can fill up on local, sustainable, handcrafted flatbreads from the Full of Life company. Pourtal also often features other local artisan ingredients in its dishes, like this ChocoVivo plate above I tried a few months ago — made with artisan goat cheese, local figs, and organic, hand ground chocolate from local company ChocoVivo. Pourtal owner Stephen Abronson (above) is often at the bar, ready to talk wine and sustainability. Go on a weekday for happy hour, and 15% of what you spend at the enomatic machines will be donated to a local nonprofit of the month — currently the ocean-friendly Heal the Bay — through Pourtal’s ongoing “Angel Shares” program. Of course, you can simply order a glass from the wine list (PDF) to enjoy while sitting at the recycled glass countertop if you’re too tired from the week to do a tasting. Wondering why I did a tasting of wines from Oregon and Alsace wines when we’ve got perfectly good Californian wines closer to us? Then you’ll be happy to know that a locavorian-friendly “Made in Malibu” Tasting Tour will kick off on Wednesday, Jan 6! A party from 7 pm – 10 pm will let you sample a flight of nine local wines — free with the purchase of a $15 Pourtal tasting card — while hearing about them directly from representatives of each winery. Don’t drink on weeknights? The tasting tour will be available on Pourtal’s enomatic machines all month.